With our fully installed & serviced washroom vending machines filled with all the must-haves; your customers won’t ever have to worry about getting caught-short. We supply a full range of essential toilet vending machine products including sanitary, contraceptive and health products, as well as nappy items. With free vending machine installation and maintenance, through to re-stocking and refills on a regular basis we offer the best packages in the UK. We offer the best service and products in the market with the latest washroom vending machines, slim options for smaller spaces, branded products and anti-vandal protection. We have a solution to suit any budget - Get in touch for a free quote! Choosing a vending machine for your business is easy with such a stylish and practical collection filled with branded products. We offer these in both white and chrome finishes to match your other items. sanitary and condom provisions. Two columns. 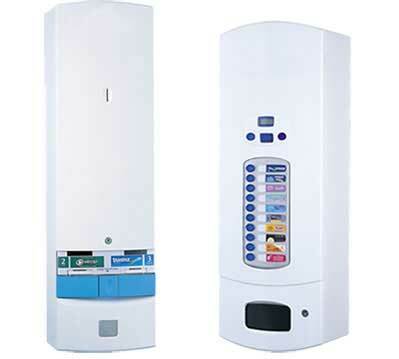 - 'Slimline Vend' for smaller spaces with slimline profile. Two columns. a disposable nappy and two baby wipes. Three columns. With our trusted brands policy, you have peace of mind that all your vending machine supplies are high quality, trusted and genuine. We offer Always, Tampax, Pampers, Mates, Anadin and more. We understand that maintaining your own vending machine can be a difficult chore; especially stocking all the replacement products. With Direct365, we'll take care of that for you, so you can focus on what's important to your business. Alongside our popular 'Nappy Vend' vending machines, we also provide Nappy Waste Disposal services. We're here to make it easy for you to find the right solution for your business's needs, schedules and budget. Find out more about our Nappy Disposal Service here.